REMS Akku-Amigo 22 V – handy and light. Powerful, easy-to-operate cordless tool for threading with unique support bracket. Ready for use any-where, without vice. Ideal for repair, renovation, job site. Li-Ion 22 V technology. For battery and mains operation. Bolt threads 6 – 30 mm, ¼ – 1"
REMS Akku-Tiger 22 V VE – the saw for the pipe fitter. Saws effortless, fast, right angle. Robust and handy. Battery Li-Ion 21.6 V, 9.0 Ah, for 100 cuts 1" with guide support per battery charge. Powerful, robust, handy cordless tool with force-transmitting guide holder for effortless, fast, right-angled sawing everywhere on site, without a vice. Also for universal free-hand sawing. Only 3.4 kg. Ideal assembly, dismantling, repair. Li-Ion 22V technology. Ideal for steel pipes and many other materials, e.g. wood, wood with nails, pallets, metal, even stainless steel, cast iron, breeze blocks, plaster boards, pumice stone, brick. REMS Akku-Press 22 V ACC – universal up to Ø 110 mm. With automatic circuit control and pressure monitoring. Anti-vibration system. Ultra-fast, safe press jointing. Automatic locking of the pressing tongs. Li-Ion 22 V technology for 50 % more pressing cycles as with battery Li-Ion 14.4 V.
Universal, handy cordless tool with automatic circuit control for producing pipe pressing joints for all common pressfitting systems. Li-Ion 22 V technology. For battery and mains operation. Pressing joints Ø 10 – 108 (110) mm, Ø ⅜ – 4"
Complete range of REMS pressing tongs / pressing rings for all common pressfitting systems. REMS Akku-Cento 22 V – Mobile cutting and deburring up to Ø 115 mm. Super fast. Right angled. Chip-free. No outer burr. Dry cutting. Li-Ion Technology. Universal for many pipe types. Light, portable compact machine. Universal for cutting and deburring pipes and tubes. For trade and industry. For the building site and the workshop. Li-Ion Technology. For battery and corded operation. Multilayer composite pipe Ø 10-110mm. 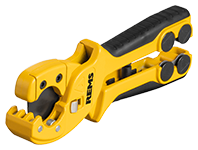 REMS ROS P 26/SW 35 – Fast cutting in one go up to 26 mm. With integrated pipe cutter for protective plastic corrugated tubes up to Ø 35mm. Robust quality tool for clean, fast cutting of pipes. With integrated pipe cutter for protective corrugated tubes. Stable magnesium version. For one-hand operation. 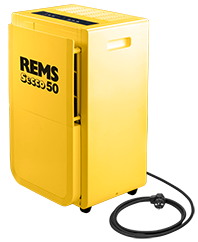 REMS Frigo 2 F-Zero – electrically freezing instead of draining. Super fast up to 2". High cooling capacity, e.g. 3/4" steel pipe in only 9 min*. Very small, patented deep-freezer heads, quickly assembled. Temperature display with LCD digital thermometer. Easy, fast freezing of pipes which are not drained. Closed refrigerant circuit. Environmentally safe. For repair and extension of piping systems. Steel, copper, plastic, composite pipes Ø 1/8–2" Ø 10–60 mm. REMS Akku-Curvo 22V – wrinkle-free bending of pipes. Universal for many pipes and tubes. Ready to use immediately without setting. Fast and creep speed operation with immediate stop for precise bending. Quick change of bending and back formers. Li-Ion 21.6V, 5.0 Ah battery for 50% more bends compared with Li-Ion 18V, 3.0 Ah battery. Universal, compact electric tool for cold bending of pipes and tubes up to 180°. Can be used anywhere, without vice. For trade and industry. For the building site and the workshop. Li-Ion Technology. For battery and corded operation. Hard, half-hard, soft copper tubes, also thin-wall Ø 10–28 mm, Ø 3/8–11/8"
Thick-walled copper pipes K65 for refrigeration and air conditioning technology EN 12735-1 Ø 3/8–11/8"
Steel pipes EN 10255 Ø 1/4–3/4"
REMS Akku-Cat 22V ANC VE – saws anything, anywhere. Extremely versatile and powerful. Li-Ion 21.6V, 5.0 Ah battery for 50% more cuts compared with 18V, 3.0 Ah. Powerful, robust, handy electric tool for universal free-hand sawing. No cable. Only 3.1 kg. Ideal for assembly, dismantling, repair. Li-Ion 22V Technology. For battery or mains operation. Many materials, e.g. wood, wood with nails, pallets, metal, even stainless steel, cast iron, breeze blocks, plaster boards, pumice stone, brick. Especially also for steel pipes. REMS Herkules XL 12" – extra stable for pipes up to 12". 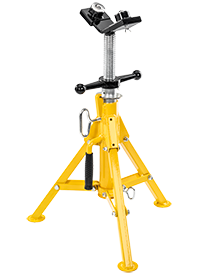 Height adjustable material support with ball guide for rotating and standing tubular and solid material. For trade and industry. For the building site and the workshop. Powerful, highly efﬁcient air dehumidi���er/building drier for drying rooms, e.g. after mains water damage, ﬂooding, dehumidiﬁcation of damp cellar rooms etc. and for fast drying of concrete, masonry, plaster and screed for example. REMS Calc-Push – effective electric decalcifying. High displacement. 3-way lever for reversal of flow direction, with zero setting. Powerful, electric decalcifying pump for effective decalcifying of pipes and containers, e.g. flow heaters, boilers, hot water tanks, cold water tanks, heat exchangers, heating and cooling systems. 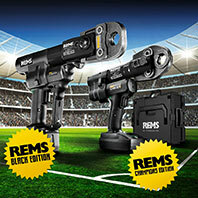 REMS CamSys 2 – Brillant pictures and videos of pipes and drains. Voice recording. Self-levelling camera. SD card slot. Electronic metering. For battery and mains operation. REMS CamSys 2 – Brillant pictures and videos of pipes and drains. Voice recording. Self-levelling camera. Transmitter for localising the camera. SD card slot. Electronic metering. For battery and mains operation. 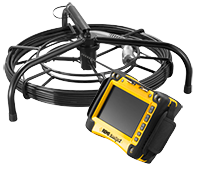 Ultra light, handy camera inspection system for inexpensive inspection and damage analysis of pipes, drains, chimneys and other hollow cavities. Self-levelling camera. Transmitter for localising the camera. Electronic metering. Also for inspection after pipe cleaning work and for acceptance of new installations or repairs. Documentation of pictures and videos on SD card. For battery and mains operation. 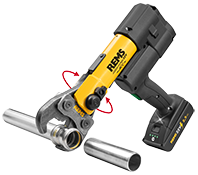 REMS Mini-Press S 22 V ACC – universal up to Ø 40 mm, 1 1/4". Super light, super small, super handy, ultra fast. 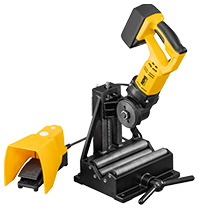 Universal, ultra handy cordless radial press with forced return for making press joints Ø 10 – 40 mm, Ø ⅜ – 1 ¼". The new REMS Li-Ion 22 V Technology sets standards in terms of economy and user friendliness and enables the user to make ultra fast pressings in less than 4 s for 50 % more pressings1). The automatic locking of the pressing tongs and the automatic retraction after completion of the pressing operation (automatic circuit control) give the user additional safety. With a weight of 2.6 kg this cordless radial press enters a new dimension. It can be used everywhere, free hand, over head, also in very confined spaces. 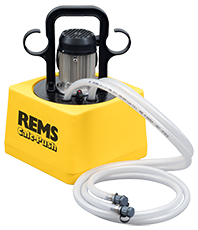 REMS Hydro-Swing – Effortless working due to oil-hydraulic force transmission. Ideal for multi-layer composite tubes up to Ø 32 mm. Also for stainless steel tubes up to Ø 22 mm. 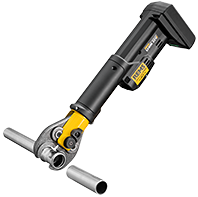 Oil-hydraulic hand pipe bender Ø 10 – 32 mm, Ø ⅜ – ⅞", up to 90°. Multi-layer composite tubes Ø 14 – 32 mm. 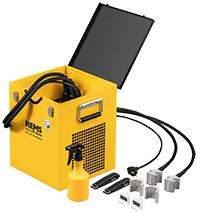 REMS Mini-Press 22 V ACC – universal up to Ø 40 mm, 1 1/4". Universal, ultra handy cordless radial press with forced return for making press joints Ø 10 – 40 mm, Ø ⅜ – 1 ¼". The new REMS Li-Ion 22 V Technology sets standards in terms of economy and user friendliness and enables the user to make ultra fast pressings in less than 4 s for 50 % more pressings1). The automatic locking of the pressing tongs and the automatic sequence of the pressing process give the user additional security. With a weight of 2.5 kg and a length including Mini V 15 pressing tongs of only 31 cm this cordless radial press enters a new dimension. It can be used everywhere, free hand, over head, also in very confined spaces.